Greenville Humane Society is hosting the 8th annual Mutt Strut Presented by Papa John’s, the largest dog-friendly race in the Southeast, on Saturday, April 27 at 8:30 a.m. Participants will follow a new course along Main Street in downtown Greenville. A Mutt Market Festival and After-Party on Main Street will follow the walk and run with family-friendly entertainment including live music and free pizza. 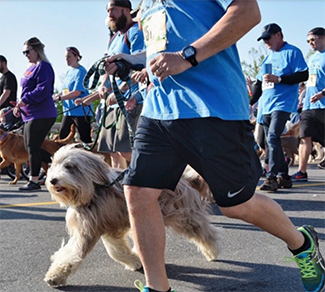 The 2019 Mutt Strut begins at 550 South Main Street in front of Halls Chophouse, and the race leads runners and walkers on a two-mile course passing the Reedy River and Flour Field. The Mutt Market Festival and After-Party will be hosted on South Main Street between the Army Navy Store and Mary’s Cottage and the celebrations will include caricature artists, face painters and sponsor tents offering giveaways. Registration is available at GHSMuttStrut.com, and those interested in participating are encouraged to sign up soon as spots are limited. The Greenville Humane Society is experiencing unprecedented interest this year due to the new course location and expects to close registration well in advance of the event. The race fee is $35 per person with discounted fees available for children. Group teams are encouraged, and dogs are not required to join the fun. Mutt Strut is the signature fundraiser for the Greenville Humane Society and provides support for the daily medical, food and needs of the animals cared for by the non-profit organization. Participants are also encouraged to raise funds as part of the race to help Greenville Humane Society reach its total fundraising goal of $50,000. To register, or for more information about race day event details such as parking and course maps, please visit the website GHSMuttStrut.com. To learn more about the services offered by Greenville Humane Society, visit GreenvilleHumane.com.